And what an amazing trip it was. Black ice wouldn’t have been a problem but it was nice that noone of us had to drive for a day. 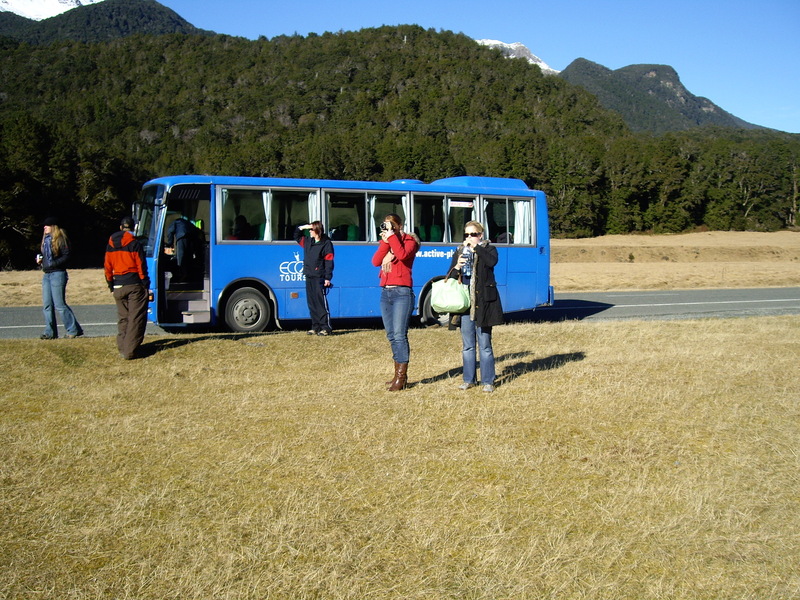 With quite a small group we boarded a quite rusty old bus in the morning and made our way towards Milford Sounds. Actually the trip with the boat exploring the sound should be the highlight but the way to the sound was already amazing. We stopped a few times at especially beautiful places to take some pictures. 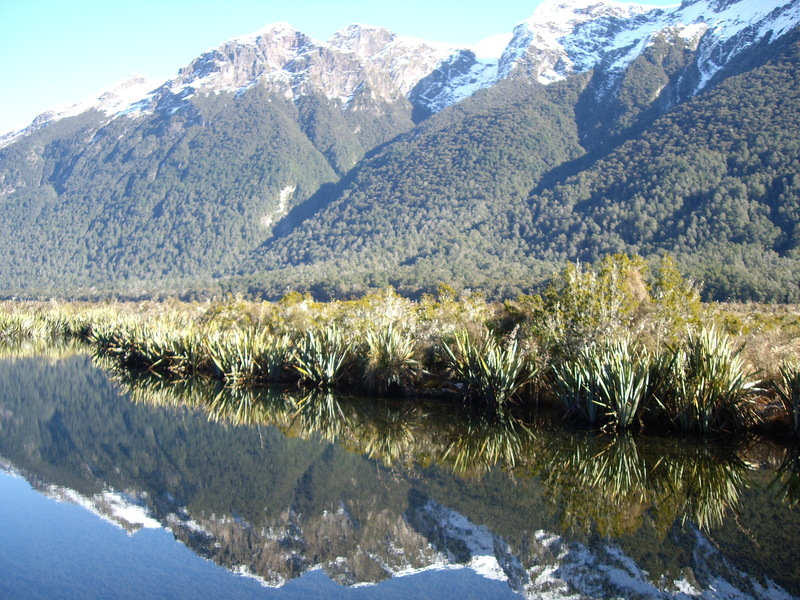 like the mirror lakes, small waterholes next to snowy mountains that reflected the mountains like mirrors. But we also saw the huge plains on between high and snow covered mountains as well as beautifully iced small creeks. Some time later we arrived at the harbour and went on a ship to drive out of the sound, getting a feeling of how huge the sound is and back in again to enjoy the special beauty there. On our way back we even saw seals playing around on the rocks. In summer you can do walks in this area but as it was winter we were quite happy to have just a limited time on board as it was freezing. Coming back early in the evening we didn’t drive on but stayed another night in the hostel in Te Anau before we went driving for another day to our last stop on the road trip: Christchurch. 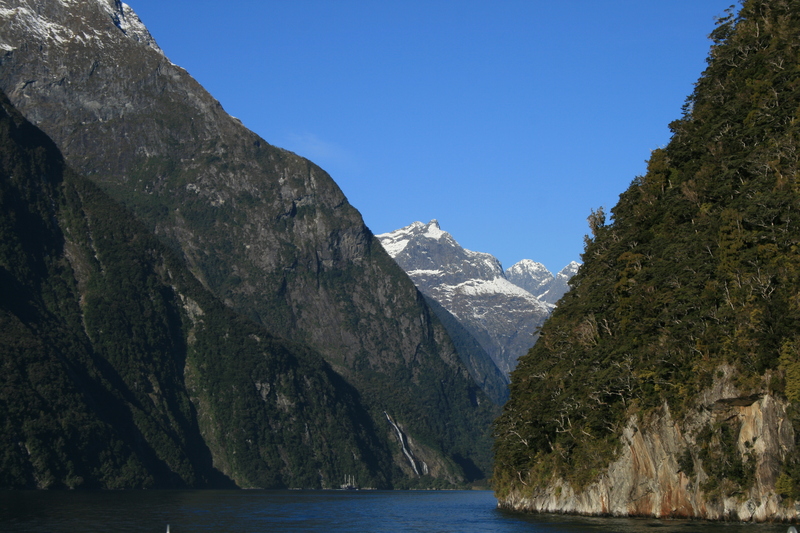 This entry was posted in New Zealand and tagged Milford Sounds, Te Anau by kathatravelling. Bookmark the permalink.